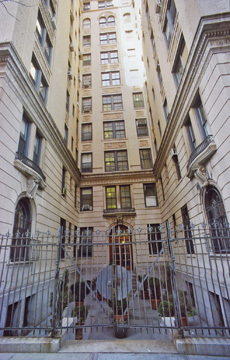 A quite stately and elegant apartment building, the Turin at 333 Central Park West is one of the very few residential buildings with deep courtyards, designed to provide more "light and air," that works well as a composition. The architect, Albert Joseph Bodker, has taken considerable liberties with the ever popular Italian Renaissance-palazzo style design and they are very successful. 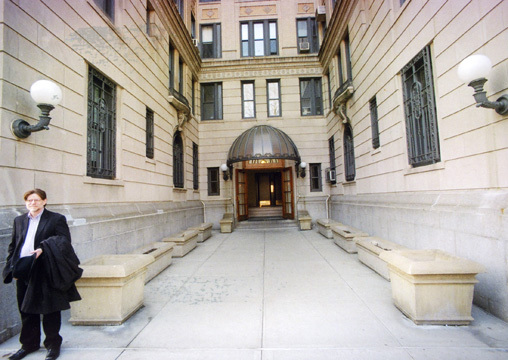 Above the traditional two-story, rusticated limestone base with arched windows on the first floor, the building has a very pronounced beltcourse that is repeated again above the 10th floor of the 12-story structure. 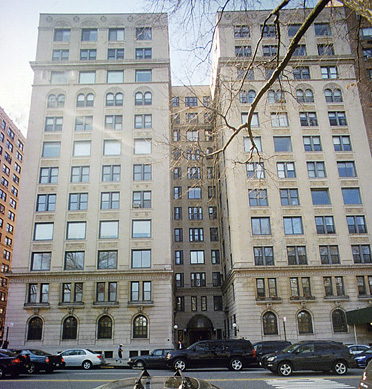 A small belt or string course is above arched windows on the ninth floor that are twinned beneath larger arched decorative elements in terracotta. The arched terracotta ornamentation is repeated on the top floor where there is more ornamentation beneath the large cornice. The building's fine beige-brick facade above the limestone base is enlivened by handsome terracotta spandrels decorated with the heads of a man and a woman. The second floor windows have very handsome short wrought-iron balconies with gentle curves that are supported, in part, by scroll limestone brackets. The archted entranced, which as a very large, half-dome, glass marquee, is deeply recessed in one of the building's courtyards and no longer has a very long canopy that stetched to the curb. The step-up lobby is very impressive. The buidling, which has protruding air-conditioners, has built by the Sturtyvant Ralty Comopany in 1909 and has 72 apartments. It has no garage. 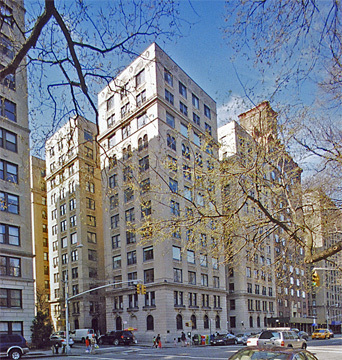 "Strong lines and good proportion," wrote Andrew Alpern in his book, "New York's Fabulous Luxury Apartments withOriginal Floor Plansfrom the Dakota, River House,OlympicTower and Other Great Buildings," (Dover Publications, Inc. 1987), "distinguish 333 from its neweer neibhros. Its four tower-like sections contain six large apartments bper floor, all of the long hall variety. In each case the entrance to the suite is at one end of a narrow corridor leading tot he living and dining rooms. The only advantage to be gained from this rather dismal arrangement is that the sleeping rooms are well removed rom the entertaining spaces, which in most of the apartments included an additional windowed reception room. The building originally boasted open cage-work elevator shafts with elaborately grilled cabs, but these, alas, have long since been replaced."